Malaysia boasts the 3rd highest level of car ownership globally - 93% of Malaysian households own and utilise at least 1 car, turning to single-occupant personal vehicles as a dominant mode of transportation. A recent BCG survey revealed that 83% respondents intend to buy a car in the next 5 years in the capital city, Kuala Lumpur (KL). 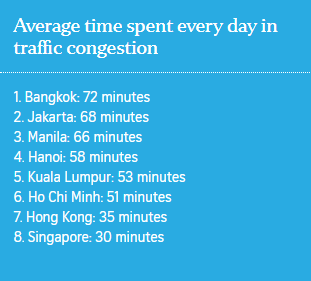 This, coupled with the rise in population growth, makes for heavily congested roads and bad traffic conditions - especially in highly dense urban cities like KL, where majority choose to travel by car. World Bank estimated that road congestion in and around KL reduced Malaysia’s GDP by 1-2% per year. In 2017, road accident per vehicle in KL was 66.5%. Dense population worsens the congestion by increasing levels of environmental degradation and reducing the efficiency and convenience of public transport services. Digitalization can have a profound impact on transportation services and may provide an avenue to relieve jams and congestion. Utilising and integration of multiple technologies can ease vehicle-to-vehicle information coordination, improve operational efficiency and passenger satisfaction. Since the introduction of Smart Cities Initiatives as part of the 11th Malaysia Plan (2016-2020), Malaysia has started deploying an intelligent IoT network in cities like KL, Iskandar, Selangor and Putrajaya. These projects incorporated IoT, cloud computing, big data analytics and spatial geographic information integration in their smart city planning, construction, management and services. With smart mobility being a key aspect of its Smart Cities vision, Malaysia launched its Intelligent Transport System Blueprint 2017-2022 to upgrade its current transportation system, with big data analytics forming the core of the system. Data gathered from ICT infrastructure is analysed to gain insights and provide alternative choices for efficient operations. Support systems such as mobile apps will help consumers make more informed transportation choices. According to the MD of Cyberview, tests have been carried out in Cyberjaya (the SV of Malaysia). Held in collaboration with a subsidiary of Telekom Malaysia Berhad, the test comprised of IoT networks, cameras with analytics capabilities and a central traffic management command centre. The blueprint for 2017-2022 will guide the continued implementation and improvements of these systems in other states. In 2018, the Malaysia City Brain project was launched - a partnership between Malaysian Digital Economy Corporation (MDEC), Kuala Lumpur City Hall, and Alibaba to optimise traffic, parking, and better manage energy. The Malaysia City Brain project sets precedence to the potential amalgamation of 5G, IoT and AI in the future traffic network. Billions of connected devices - cars, street lights, cameras, utilities, buildings - could be regulated to communicate 10-100x faster than today with ultra-ultra-low latency and massive capacity. When completed, the project will include an ecosystem of businesses, private organisations and government agencies installing the use of large-scale computing engines, Asparam to optimise traffic flow and generate structured summaries of data, such as traffic volume and speed in particular lanes. MDEC also signed an MOU with ride-hailing company Grab. Grab was previously involved in the 2017 SEA Games in Malaysia and had proven its capability to mitigate traffic congestion. Under this partnership, Grab’s real-time anonymised traffic data for popular KL routes will be shared from Grab’s GPS data streams to Malaysia’s traffic management agencies and city planners. Grab influences travel decisions of 2.5 mil Southeast Asians daily and is a key source for efficient and accurate data to reflect real drivers and city dwellers in everyday conditions. Penang is also on their way to Smart City Roadmap 2030. One of the recent projects includes collaboration with a local telco infrastructure services company edotco Group to run a “Smart Bus Stop” POC. Two bus stops with high bus ridership will have USB charging pods, CCTVs, panic buttons, WiFi facility, digital directory and digital advertising signage installed to enhance convenience and safety. The POC is expected to run till April before evaluating the results of public transport users increase and satisfaction. 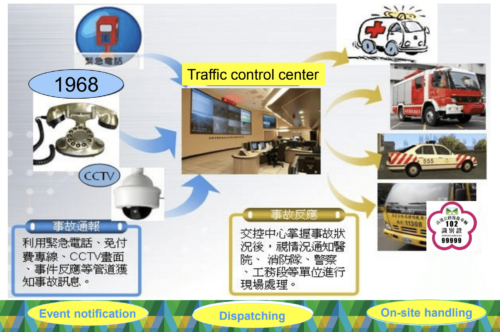 Enabling innovation in mobility, public safety and sustainability, the City Brain technology was first used in Hangzhou, China. Its ability to predict traffic flow, detect accidents and provide instant feedback has resulted in significant decrease in congestion. Traffic efficiency has been increased by 15%, saving on average 3 minutes on traffic per vehicle. Hangzhou’s landed at the 57th position in China’s list of ‘The Worst Congested Cities’, previously being the 5th. Not only did City Brain shortened commutes, in the case of medical emergencies, it is also able to change traffic lights and make way for ambulances and fire trucks to head to their destinations 49% faster. The technology does so by gathering digital data via videos from intersection cameras, GPS data on locations of vehicles, and coordinating over 1000 road signals. In Taiwan, the successful implementation of ITS technologies to achieve “seamless shift” from the original “time-based charge” to mileage-based charge” has gathered much compliments in its effectiveness of relieving congestions. 99.7% vehicle detection accuracy was recorded and 99.3% of 14 mil daily transactions is automatically processed. The city of Amsterdam won the Smart City award with its open data programme. This open data programme is built around the premise that the city shares its data and businesses develop apps using it. Charging points and public transport (trams and buses) – all free available. As part of its mobility concept 2.0, Car2go, an innovative electric car sharing scheme has made Amsterdam cleaner, quieter and energy-efficient. In India, traffic congestion during peak hours in cities costs about US$110,000 per annum, which led to Modi government’s decision to develop a fully integrated public transport system and to discover the potential of new technologies including smart parking. In 2018, Maharashtra adapted a new urban bus scheme incorporating automated announcements, fare collection systems and an online network that manages vehicles and stocks to increase the efficiency of transport systems. Can Traffic Woes Become a Thing of the Past? At the upcoming Asia IoT Business Platform Malaysia on April 23 - 24, the above topic will be discussed as part of the Smart & Connected City focus session. The discussions will tackle challenges faced to develop a fully integrated public transportation system, discuss progress of the currently implemented initiatives, discover potential of emerging technologies like smart parking, and explore ways to alleviate traffic congestions. Download brochure here. Drop me a note if you would like to contribute to the discussions. This article is adapted from Asia IoT Business Platform blogpost here.